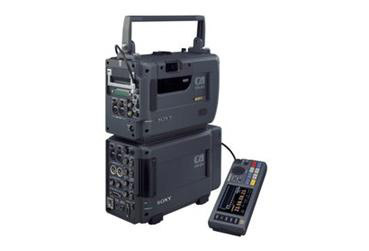 The SRW-1 HD Portable Digital Video Recorder and SRPC-1 HD Video Processor are the newest members of the CineAlta product lineup and form the first Sony full-bandwidth 4:4:4 (RGB) portable VTR system adopting the HDCAM-SR format. The SRW-1/SRPC-1 offers virtually lossless 1080-line high-definition recordings at multiple frame rates on the HDCAM-SR tape media. The SRW-1/SRPC-1 connects to its companion HDCF950 portable camera via HD-SDI dual link or optional optical fiber cable to create a convenient, portable full-bandwidth 4:4:4 (RGB) image capturing system. The SRW-1 can also be configured with the HDWF900 HDCAM camcorder to record HD 4:2:2 component images. The SRPC-1 processor unit provides a variety of video-processing functions and houses an array of input and output connectors, including HD/SD signals, 12 channels of digital audio, and 4 channels of analog audio. The processing functions include 2-3 pull-down insertions for 525 down conversion, and RGB 4:4:4 to Y/Pb/Pr 4:2:2 color space conversion. The system is capable of operating in three recording modes. SQ (standard Quality) providing 440 Mbps video payload to tape in both 4:4:4 or 4:2:2, HQ (High Quality) mode allowing for 2x speed recording yielding 880 Mbps to tape with a 2:1 compression ratio in full band RGB 4:4:4, and 3D mode where two separate 4:2:2 HD SDI inputs can be recorded simultaneously to the same tape, providing an efficient means of recording stereo full bandwidth 4:2:2 images for 3D productions. Each stereo channel is recorded at 440 Mbps with the benefits of full error correction to both channels. Long Recording Time The SRW-1/SRPC-1 is capable of recording up to 50 minutes at 1080/23.98P and up to 40 minutes at 1080/59.94i or 720/59.94P on a single S-sized HDCAM-SR cassette.